Fukumaki Firefly Country: One of the leading scenic spots in the country. In the town of Nichinan, there is a place called "Fukumaki," meaning "A myriad of fortunes will come." The name suggests that one may feel happiness just by visiting this place. All of the fireflies in Fukumaki are wild fireflies. They may just bring you happiness if you catch sight of the approximately 20,000 Himebotaru fireflies, as well as the array of light from the Genji fireflies that live here, as they gracefully dance on the river. Please take a visit to Fukumaki Firefly Country, one of the leading scenic spots not only in Nichinan, but in the country. Himebotaru fireflies fill the mountain surface, while Genji fireflies dancing elegantly in the sky produce a feast of sound. Fukumaki is a rare firefly viewing site in Japan where both Himebotaru and Genji fireflies can be seen simultaneously and on a large scale. Himebotaru are characterized by a light that flashes twice a second. The females remain on the ground, and the male flies 1-2 meters from the ground while emitting light. Genji fireflies are characterized by a light emission time of a few seconds longer than that of the Himebotaru. Females stay on surfaces such as leaves, and males fly in the upper skies near the waterside while emitting light. In Fukumaki, the Himebotaru and Genjibotaru viewing areas are located opposite each other, and the peak time for each type of firefly may overlap once every few years. It is no exaggeration to say that this overwhelming scale and beauty is unmatched in Japan. At the Fukumaki Firefly Country shuttle bus arrival and departure area, T-shirts, postcards, and various soft drinks to enjoy after watching the fireflies are for sale. Boot rental is also available here for those who are concerned about foot comfort. In accordance with the operating season of Fukumaki Firefly Country, an area offering firefly goods with items such as T-shirts and postcards is expressly set up. Business hours extend until the final shuttle bus returns to the rest stop from Fukumaki Firefly Country, so you can use the rest stop to relax after watching the fireflies, etc. Please do not use light from cell phones, car lights, camera strobes, flashlights, etc. Fireflies' eyes have developed to take care of their offspring. Even a small amount of light can cause them to mistake mating partners, which will reduce their life span. Please refrain from using loud voices or making loud noise. As with light, fireflies are also sensitive to loud noises, which can shorten their lifespan. Please do not use insect repellent sprays or mosquito coils. This weakens the fireflies. If you are sensitive to insect bites, please adjust the length of your shirt sleeves. Fireflies are very short-lived and delicate creatures that cannot cope with changing habitats. Please listen to instructions from the staff on site. In order to preserve the chance for everyone to safely view fireflies next year and for years after, please be sure to follow to the staff's instructions. In 2018, an entrance fee (preservation fee) of 500 yen was established. Fukuwari Hotarunokuni is a journey of approximately 1.5 km in length. I will explain each point. You can park about 10 cars. There is no parking nearby. Please use the shuttle bus to reduce traffic congestion and protect the environment. Genji firefly begins to fly from among the cedars in a place where you can feel that you have visited the Fukunari Firefly Country. If you find the first fireflies, it will be natural and exciting. It is a spot to see Himebotaru first from the start point. The number has been increasing rapidly in recent years. The bus is roundabout and shuttle and tourist buses can be reached here. There are also stalls, toilets, and entry ticket counters. Wheelchair rental service is also available. When the white flowers of the chestnut tree planted on the roadside are in full bloom, the Genji firefly will also be at its best. Hundreds of Genji firebugs dance in spots called Genji mansion on the other side. 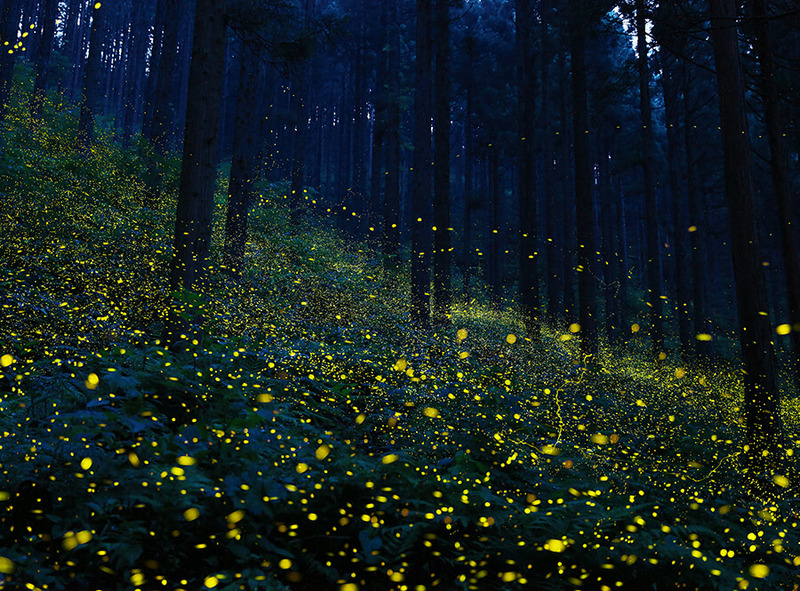 The so-called "Firefly Corridor" where fireflies begin to show bustle. Genji firefly on the river, Hime firefly on the mountain. The figure that Himebotaru and Genjibotaru fly in front of you will be able to sense the prosperity of the Fukuwari firefly country. The Fukuwari Hotarunokuni began to prosper based here. The image of the "Firefly Communication" blog, where the "Yamakami Community Development Committee", which has long been engaged in firefly protection activities, is also taken here. The whole view of the firefly corridor will become clear if you look at the top and bottom of the well-being firefly no country from the popular name "Noro Yamaguchi". On the other side of the river, Himebotaru is increasing rapidly, but because it is a private path and dangerous creatures such as a viper lurking, please look from a distance. The valley narrows sharply, and the firefly and the firefly approach quickly. Himebotaru glowing in the dark is like looking at the stars of the universe up close. Genji fire flies elegantly over the sky far above the head and melts into the sky of a full moon. Enjoy the spectacular view as if you had gone on a space trip! ! It is finally close to the end of the event. The voice of the wolf and the serpent of the river heal your ears. Himebotaru, who travels between the left and right forests, can see people walking in the dark as part of the forest or crossing the front of people. Copyright©2018 YORIMICHI NICHINAN.All rights reserved.